With several successful films under their belt since their modern revival, Hammer Film Productions has decided to expand into the world of audio drama. They wisely chose to team up with Bafflegab Productions, whose work includes The Brenda & Effie Mysteries and The Scarifyers, and gathered a dream team of writers. Both Stephen Gallagher and Mark Morris have penned numerous horror stories and episodes of Doctor Who and Stephen Volk is the man behind the infamous Ghostwatch TV special. Christopher Fowler’s thrillers made him a perfect candidate and comedian Robin Ince proves he belongs in this group with his darkly humorous story. Getting to the stories, “The Box” tells of mysterious happenings at a simulator designed to help train Wainfleet Maritime College students escape from a sunken helicopter while “The Fixation” has a man whose attempts to organize a clean up of his neighborhood result in terrorized volunteers and strange disappearances. “Sticks and Stones” deals with the phenomena of people trolling the internet to let off steam. But what happens when one man’s nasty messages start coming true? The wonderfully atmospheric “The Devil in the Darkness” finds two coworkers trapped in an elevator for days and also shows off the strengths of the audio play format. What happens when a snooping, overbearing mother finds out her adult son is dating one of her friends? “Spanish Ladies” has the answer and you know it’s not going to be pretty when it’s a Hammer horror production. “Don’t Go There” takes us away from the British Isles and to Greece, where one man’s quest to find out what left his son in a coma leads him to a most sinister revelation. 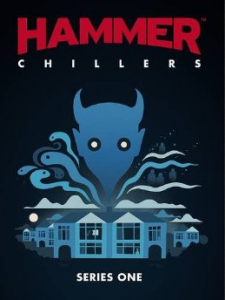 In this first season of six stories, Hammer Chillers lives up to its name and acts as a spiritual successor to the Hammer House of Horror television series, with all but the lengthy “Don’t Go There” clocking in at around half an hour in length. Everything from the writing to the performances is perfect and you will not regret your listening experience. In addition to digital downloads, there’s also a physical CD release! Did I also mention this digipack release includes a highly informative documentary about the making of the series? Stories more in line with the gothic Hammer classics (including appearances by those who starred in such films) would have been appreciated, but I also understand the deaths of their biggest stars make such a task almost impossible. Perhaps they could try dusting off a unproduced scripts from the old days and reworking them into audio productions for the next series? Although it is worth pointing out how one of the tales does have a connection of sorts to one of lesser Hammer horror films. I won’t say which, so you’ll just have to order a copy to see what I mean. Special thanks to Bafflegab Productions for the review copy!